Mark Owens, Chairman of the Montgomery County Democratic Party, was the guest speaker this evening at the South of Dayton Democratic Club meeting. We had about seventeen members in attendance. Mark gave a nice analysis of elections in Montgomery County and challenges for Montgomery County Democrats in coming elections. I wanted to be polite to Mark, our guest, but I also thought it important to ask the County Chairman directly to respond to issues that, I feel, long time, loyal Democrats — as those in attendance at this Democratic Club meeting — need to be aware of, and need to discuss. In the question period this evening, in answer to my questions, Mark was unrelenting in his defense of the endorsement actions of the County Party. I was surprised to hear that in his opinion that in the matter of endorsements, the majority of county Democrats, if asked, would approve of County Party’s actions. I said that I, personally, am very disappointed in the Montgomery County Democratic Party because of its antidemocratic actions, and that in 2010’s Party Reorganization Meeting, I would be looking to elect a Chairman who would change some of the party’s established endorsement practices. I asked Mark if he would mind reviewing with the Club the the primary race in the 40th Ohio House District — an open seat because of Fred Strahorn reaching his term limit — between two well qualified Democrats, Roland Winburn and Victor Harris. The Selection Committee, consisting of about 25 people, urged that Roland Winburn receive the official endorsement of the Montgomery County Democratic Party. And the Central Committee, rubber stamp that it is, agreed to make the official endorsement. The Party subsequently printed handbills that were given to Democrats everywhere, including to early voters, and, at the polls on election day, showing that Winburn was the officially endorsed candidate of the Montgomery County Democratic Party. Harris made a good race, but Winburn won 56% to 44%. Mark was gracious and said that he was glad to discuss the matter and that, in his judgment, the County Party’s endorsement of Winburn over Harris, in fact, was not an antidemocratic action — because the Selection Committee and the Central Committee were chosen democratically and made their decisions democratically. Truly, a breathtaking defense. I pointed out that in the old Soviet Union, the Politburo also decided issues by voting. But the members of the Politburo didn’t pretend their privilege to vote had anything to do with democracy. Their vote was all about who had the power and who had the right. Mark agreed that Vic Harris is well qualified to represent the 40th OHD in the State Assembly, but, Mark said that the Selection Committee members resented the fact that Vic was a newcomer, who hadn’t paid his dues to the party; they felt Vic hadn’t worked his way up in the organization, but, felt, on the other hand, that Winburn deserved endorsement because he had contributed a lot to the local party. I didn’t point out what is obvious. There was another big reason Harris was snubbed. Other than Winburn, the one person who gained the most by the Party making such an absurd endorsement, was Fred Strahorn, and Strahorn has a lot of pull in the party — particularly on issues dealing with OHD 40. Vic Harris was threatening to compete on Strahorn’s turf, and whereas Winburn is of an older generation, soon to be retired, Harris is the same age as Strahorn. I’ve argued with Mark that the Democratic Party would become stronger the more it encourages democratic processes. Let the Republican Party be seen as the party of exclusion, the party of secret groups, the party of cliques, the party of hierarchy. The Democratic Party needs to stand for democracy. The 40th OHD reliably goes 70% Democratic. Voters in this District really only have one opportunity to choose their state representative and that is in the Democratic Primary. But long time members of the County Selection Committee want to be able to make the choice of who, in this strong Democratic District, will be elected. They want only one name on the Democratic Primary ballot. These wheelers and dealers in local politics want to be able to pay back favors, reward loyal service, and punish disloyalty. The Party has an effective technique used to suppress Democratic Primary participation. To suppress participation, the Party makes its endorsements before the deadline for submitting petitions to the Board of Elections. Potential candidates, who have already gathered enough signatures to qualify their name on the ballot, almost always withdraw when they don’t get the Party’s official endorsement. They don’t want to run against the Party, for fear that will not only lose, but that in the future, the Party will retaliate. The end result is that usually only one name is left on the Democratic Primary ballot — the endorsed candidate. Vic Harris bucked the Party and kept his name on the ballot and ran a great campaign — but he proved the rule that, even a highly qualified and dynamic candidate, finds it is very difficult to win against the officially endorsed Party candidate. I pointed out to Mark that because Winburn got the Party’s official endorsement, Democrats in the 40th OHD were cheated of an opportunity to experience a meaningful campaign. Assured of a primary win because of the County Party’s official endorsement, Winburn refused to debate Harris. Winburn refused to have joint appearances with Harris. Why should he? The fix was in. The opportunity to elevate the process to engage Democrats in the 40th District into a meaningful discussion of issues was lost. The chance to give 40th District Democrats a meaningful choice was lost. An official policy of discouraging candidates from running in your own party’s primary, I feel, is a despicable antidemocratic action. Obviously, others disagree. In this meeting, Mark surprised me by defending the Party’s action in the Harris / Winburn matter and by asserting that, in his judgment, the Montgomery County Democratic Party’s actions concerning primary endorsements, would be approved by most Democrats in the county. I think Mark’s idea that County Democrats would defend such practice is flat wrong. I feel that if Democrats understood the antidemocratic practices of their County Party, most would strongly object. But, at our South of Dayton Democratic Club meeting this evening, it was obvious that the group was divided about this issue. Every four years, Montgomery County Democrats have a chance to remake their party. Every four years a new Central Committee for the Montgomery County Democratic Party is elected, and then this new Central Committee elects a new county chairperson. This happens again in May, 2010. I failed to ask Mark if he would seek reelection to the office of County Chair, but I’m thinking he probably will. Before the Reorganization Meeting in May 2010, the issue of whether Montgomery County Democrats should suppress Primary participation should be discussed by County Democrats. I think it is a key issue that potential candidates for the office of County Chair should address. I became a member of the Central Committee in 2006. The first meeting I attended was the Reorganization Meeting and I was flabbergasted by the stampede to reelect Lieberman — no opposition, no discussion, no questions, no speeches. But in 2010 I hope things will be different. As this report indicates, I probably talked too much at the Club meeting this evening. After the meeting, I greeted Mark. I told him that though I strongly disagree with his positions, I don’t want to be uncivil. Mark seems a likeable, well meaning person. But, as long as Mark holds his antidemocratic positions, I will oppose his reelection to the position of Party Chairman. Big meeting last night at the Montgomery County Democratic Party’s Headquarters. The party endorsed primary candidates for the Ohio House and the Ohio Senate. At the previous meeting in October, my motion to discontinue the practice of making early endorsements was soundly defeated, so this action by the party last night, though depressing, was not surprising. A DDN article today, “Public Workers’ Political Activity Limited,” tells that one-fourth of the 186 members of the Central Committee of the Montgomery County Democratic Party (MCDP) are employed as Montgomery County government workers, and one-tenth of the 278 members of the Central Committee of the Montgomery County Republican Party (MCRP) are county government workers. Of the total 360 precincts in the county, only 132 precincts (37%) — shown in yellow — are participating in the May 4 Democratic Primary to elect a member of the MCDP Central Committee. The first task of these elected members will be to act as a voting delegate to the reorganization meeting where the leaders and the direction of the party for the next four years will be determined. ABOUT This Website — See the big idea of what this web-site might become. Tell me what you think. The map of Montgomery County showing MCDP representation by precinct. Analysis of Democratic Party county constitutions and links to PDF’s of 25 county constitutions in chart form. The survey — concerning seven proposed changes to the MCDP constitution. The forum — inviting your participation. 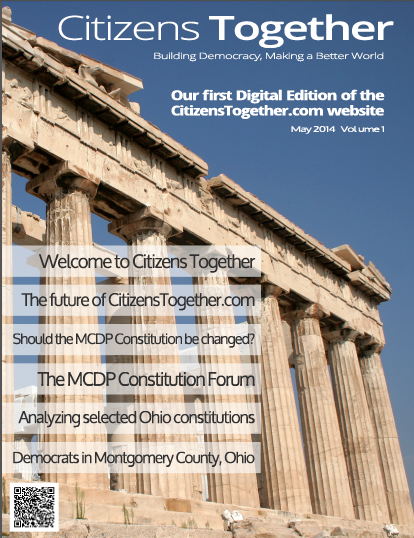 Browse all the articles on Citizens Together with our iPad/tablet-friendly digital version the website! Clean, easy-to-view PDF format is compatible with most all computers, tablets & smartphones. No buggy apps to install, and you can read it offline at your convenience.